Their drop-in design means adding performance is simple. You simply remove the disposable air filter and replace it with a K&N. See applicable instruction sheet for details. 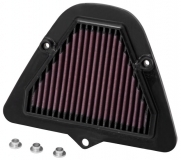 Our stock replacement air filters for street vehicles are covered by our famous K&N Million-Mile Limited Warranty™ and will be THE LAST AIR FILTER YOUR VEHICLE WILL EVER NEED.